When you are advertising your business, it’s important to make use of every inch of space. It’s also important to choose top-quality materials and vivid graphics to grab the eye of your target audience and leave a strong, positive first impression. 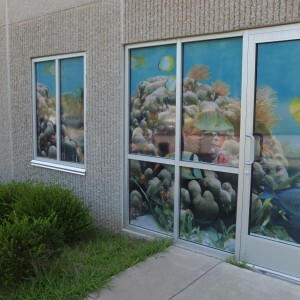 That’s why window graphics are so popular among advertising and marketing executives. They capture the target market, help advertisers make use of their existing property, and create a nearly limitless canvas on which to increase brand awareness. But, what products are best for these types of applications? The answer is simple – UV window film. A high-quality, perforated window film that is compatible with UV printing can help you make use of store fronts, retail spaces, high-traffic areas, and more. Ultraflex Systems, Inc. has been committed to providing exceptional digital print media products to advertisers, printers, private brands, and more for over a quarter of a century. As a result of our vast industry experience, we turn out a wide range of best-in-class products, and our perforated window film is no exception. UltraVision® Window Perf 60/40 UV was developed specifically for advertising on storefronts, windows, and more. Consisting of a remarkable perforated, white-gloss, calendered, graphic window film with a black adhesive backside, this innovative product features a unique center release liner that easily catches excess ink during printing to keep the perforated holes clear and your graphics precise. Ideal for exterior mounted window advertisements, UltraVision® Window Perf 60/40 UV also offers optimal two-way viewing, is available on 39” and 54” rolls, and can be used with solvent, eco-solvent and UV inks. In addition to window film, Ultraflex Systems, Inc. also offers a wide variety of other digital print media products to help you continue your brand campaign. From front-lit, back-lit, and blockout media to mesh banner material, specialty materials, textiles, and more, we are your single source for all of your digital print media needs. If you are in the USA, England, Scotland, Mexico, Canada, or elsewhere worldwide and need UV window film or any of our other top-quality products, contact our experts today for more information. We look forward to serving you!